To fully grasp the meaning of Nelson Mandela’s death, at the age of 95, imagine for a moment that his life had turned out differently. What if he’d perished as a child, like so many youngsters of his generation in the rural backwaters of the Transkei? Think of what might have happened, or not happened, if he’d died in the mines of the City of Gold, Johannesburg, where he arrived as a young man after running away from his village. Of course, he survived not only the privations of apartheid—that savage and extreme system of racial segregation—but also the long liberation struggle as well. Should it go without saying that Mandela was not shot in the back, like demonstrators at Sharpeville in 1960, or gunned down in the streets like young protestors in Soweto during the June 16 uprising in 1976? Though he believed in armed struggle, and became a leader of an armed guerrilla insurrection, he escaped the fates of so many other comrades who were killed in the bush, blown to pieces by letter bombs sent by the authorities, poisoned by secret agents or hanged for treason or sabotage, which seemed the likely result when sentence was pronounced for him and other top leaders of the African National Congress after a long trial back in 1964. Rolihlahla Dalibhunga Mandela was spared the death penalty a half-century ago. He wasn’t forced into exile, like so many others, and did not lose his sanity or have his spirit broken from decades of imprisonment. He managed to survive tuberculosis and prostate cancer, outliving nearly all of the closest friends of his generation. Though it was once illegal to publish his photograph or quote him by name in South Africa, his image was picked as the rallying symbol of a global campaign against apartheid in a massive international organizing drive much like the effort to end slavery a century earlier. It was only natural then, and just, that when Mandela emerged from prison in 1990, he felt such a powerful sense of obligation to the fallen. It would be a shame if, in celebrating the remarkable arc of his life, we neglected to mention millions of others not lucky enough to become—like him—exceptions to old rules. Mandela outlived not only his contemporaries but also three of his six children. He survived long enough to witness the first stages of revisionist histories written about his life and politics. This meant having to face up honestly to the myriad ways in which the grand early hopes for radical transformation ran aground. After all, in April of 1994, when democracy arrived in South Africa, advanced global capitalism and AIDS also swept in the door. This meant that structurally high rates of unemployment and rising inequality coincided with massive loss of life from the pandemic which, in turn, conspired against the aerie dream of establishing a nonracial, antisexist, non-homophobic and more egalitarian society at the southern tip of Africa. Time has exposed Mandela’s own failings. In office, he failed to respond to the rise of HIV/AIDS. He protected cronies accused of corruption and failed to enforce distinctions between personal favors, party business and government decision-making. His dedication towards the governing party, the African National Congress, meant that he subjected himself to the policies of its “collective leadership” and, after stepping down as president in 1999, supported two flawed successors during election campaigns, tarnishing his own image in the process. In the last decade, quarrels with old comrades also spilled wince-worthy details of dodgy financial arrangements into public view. There were even lawsuits within the family over money. Even here, though, there was a kind of backhanded tribute: these facts emerged eventually into public view. That, too, was part of Mandela’s legacy, because in spite of a deep reservoir of popular affection for Utata, or Madiba, as he’s known, he and the party never allowed the trappings of the kind of cult of personality upon which so many other liberation struggles in Africa and elsewhere have foundered. Mandela’s personal troubles, like the failures of his party, were part of the public record revealed by a free press. Nineteen years into the South African democratic experiment, there’s a vibrant civic culture that exploded to great effect in protests over the government’s former AIDS policies, an independent if quite pressurized judiciary and an impressive if embattled media. Mandela’s way of dying also embodied an important lesson, almost as if he intended to carefully stage his own departure. Eight years ago, he’d begun plotting a long, slow fade-away from public life. In 2005, he regularly told advisers they should plan more openly for his demise. “Everybody dies,” he began to say repeatedly. In his impish, soft-spoken, teasing way, Mandela did his best to take the sting out. After he stepped down as president in 1999, rumors periodically circulated that he was dead, or dying, and then these rumors led to stockpiling of goods and fear-mongering, particularly among right-wing whites, about incipient violence. By 2013, these were the views of a vanishing few. In 2007, he reinforced the message about his own mortality at a celebration I witnessed of his grandson’s decision to accept the post as Nkosi, or head man, of Mvezo, Mandela’s birthplace. 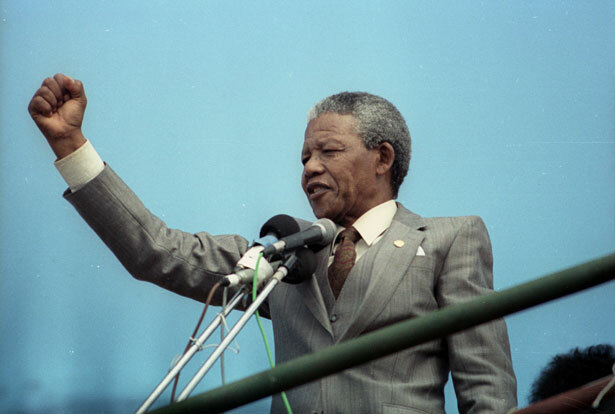 As he struggled to be heard above a howling wind, Mandela said: “Now, I can die in peace.” There was a visible charge that ran through the family and villagers when he said this, but in the intervening years people have come to grudgingly accept the idea that a man in his mid-90s might be ready to fold up his tent. The last time I saw Mandela at his home after the World Cup three years ago, he greeted my son and me with a well-worn line: “It’s nice that young people still come around to see an old man even though he has nothing new to say.” He loved little jokes, but here the pat phrase revealed a deeper intention, I think, to signal that it was time for young South Africans to step up and take the revolution he’d begun much further. More than half of the South Africa’s population is under 25, which means that young people grew up entirely in the new dispensation. For them, Nelson Mandela was always a grandfatherly figure; after all, he was 72 years old by the time he was released from prison. The elder Mandela had done his best over the years to prepare South Africans for the next stage in the struggle to create a new nation. Now it was part of his legacy that so many of his countrymen had grown tired, even angry, at being asked whether the dream of establishing a new kind of society would outlive him. Of course, the vision of creating a new kind of nation was always bigger than a single leader. To presume that he was a singular linchpin whose exceptional qualities alone were responsible for the “miracle” transition to democracy in South Africa during the 1990s was not only magical realist thinking but also profoundly ahistorical and even racist. It was perhaps his most enduring gift that this question, asked ritualistically by outsiders, should sound so silly, so wide of the mark, on the day he died. In the end, there was a period but no question mark. Would the dream survive? The answer: it already had. What is next for the ANC? Douglas FosterDouglas Foster, associate professor of journalism at Northwestern University, is the author of After Mandela: The Struggle for Freedom in Post Apartheid South Africa.